Fall is all about pumpkins! Add some to your fall decor with no-carve pumpkin ideas that range from spooky to cute and playful. Because there's no cutting involved, you can use either a real pumpkin for this season​ or use a fake pumpkin that you can keep for years to come—or redecorate next year. No-carve pumpkins are a great seasonal project for all ages, and the pumpkins last much longer than when they are carved. Who says pumpkins have to be spooky? With a little spray paint and some pom poms, you can create fun, colorful, and whimsical pumpkins for Halloween this year. Opt for fake pumpkins and you can reuse these as decorations year after year. This cute fabric pumpkin is as easy as 1, 2, 3 steps (cut, glue, lay the fabric)! Create this DIY using a fake pumpkin so you can decorate with the finished product year after year. Decorate your pumpkin this Halloween with a crescent moon, using fresh white flowers to create a stunning pumpkin that would look lovely as a centerpiece on your dining table or beside your front door. Make your guests think a little—and laugh a lot—with some hilarious and silly DIY pun pumpkins. Use up some of your old nail polish colors to add a glam marble design to your pumpkins this Halloween with this lovely DIY. This understated and eerie matte black pumpkin is very quick to make and perfect for any Halloween. If you've ever wondered what Jackson Pollock's pumpkins would look like, this might be it. Here is a Halloween pumpkin decorating idea if you have young children. Paint your pumpkin with chalkboard paint and let your child decorate the pumpkin with chalk. This simple to make DIY gold dipped pumpkin would look perfect in your home all fall as a festive home accent. Write your own custom message on your pumpkin this year for a quick pumpkin decorating idea perfect for Halloween. Glow In The Dark Pumpkin. Once it gets dark on Halloween and children begin trick or treating, these DIY glow-in-the-dark pumpkins will look absolutely amazing outside your home. Highlight the beauty of fall this year by covering your pumpkin with fallen leaves you have found outdoors. Doodle a pattern onto your pumpkin, using a paint marker to create these spectacular mud-cloth-inspired pumpkins for your home this fall. Create the perfect pumpkin for your Halloween party by painting it white and decorating it with festive gold-foil confetti. Make painterly pumpkins with a stylish brushstroke pattern in contrasting colors by using two shades of acrylic paint and one medium or small paintbrush. Play with bright neon paint when decorating your pumpkin by creating your own set of white pumpkins dipped in assorted colors of neon paint. Paint your own chic pumpkin with a beautiful golden ombre design this Halloween with this simple DIY. Instead of the traditional jack-o-lantern, create your own grouping of chic black-and-white pumpkins this Halloween. For the animal lovers, why not make an animal-themed pumpkin this Halloween? Using templates, you can make a cat, an owl, or a fox and embellish it with felt and googly eyes. If you long for the days of summer or simply want an off-beat Halloween pumpkin idea, this DIY pineapple pumpkin is such a cheerful and fun way to transform your pumpkin. Repurpose those paper doilies into chic decorating accessories that add beautiful, intricate designs—with no carving! 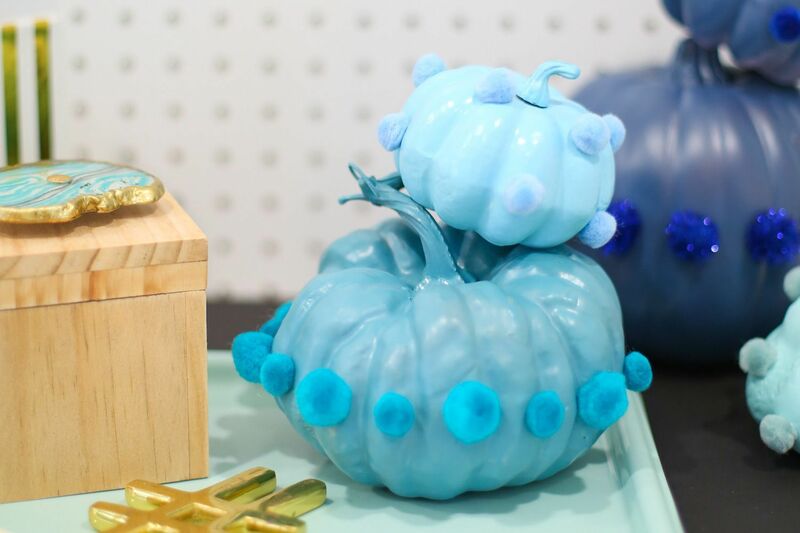 Inspired by Cinderella's dress, which is pale blue and covered in small butterflies, this whimsical pumpkin is so pretty and would be perfect to make this fall. Children will love decorating their own pumpkin with this simple DIY, where pieces of tissue paper in a variety of colors are stuck to a pumpkin with Mod Podge. Instead of attempting to paint or carve a design a pumpkin, cut out a black-and-white image of a bug and stick it to a gold pumpkin to create stunning a decoupage Halloween decor. Who knew office supplies could make such a colorful Halloween pumpkin? Make a playful pumpkin this year by inserting colored pushpins in a cheerful rainbow-dot pattern. Painted And Glitter Stem Pumpkins. 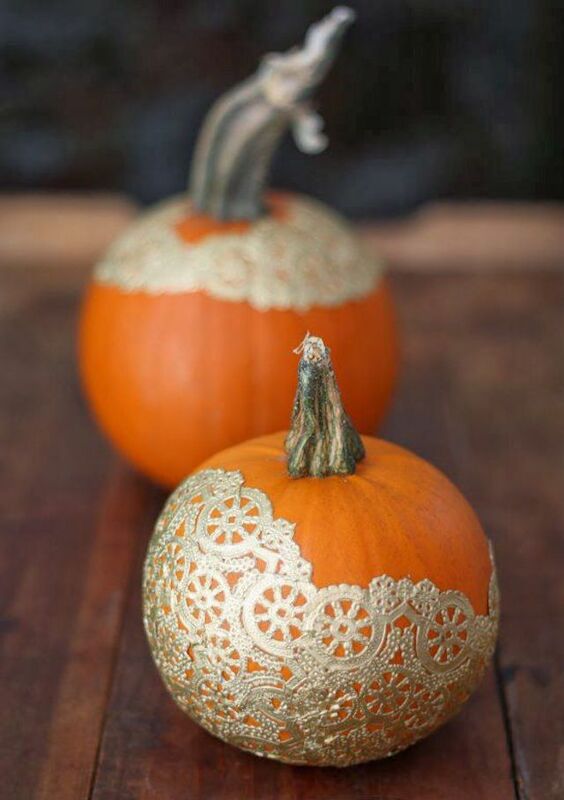 Gather together several pumpkins and paint each one a different color, then paint all the stems with gold glitter. These DIY copper-striped pumpkins are the perfect last-minute Halloween decorating idea, as they are decorated with just a few strips of copper tape to create a beautiful design in minutes. Typically Halloween pumpkins are decorated in the standard colors of black, orange, purple, or even dark green, but these candy-colored pastel pumpkins are a sweet twist on tradition. Quickly decorate your pumpkin with spray paint to achieve a gilded finish on the bottom. Once the bottoms dry, hand-paint a decorative triangle border for a chic design. Add a bit of sparkle to your Halloween decor by making a polka dot pumpkin with gold sequin dots. For a modern twist on a traditional spiderweb, add an ombre design as the background to your pumpkin. Halloween is all about scary and sweet treats, so why not decorate your pumpkin this year to look like one of your favorite sugary treats, a delicious donut. If you are looking for less scary and more bling, dip a painted pumpkin in gold confetti! Start with mint green chalkboard paint and add accents with a gold paint marker. Simply perfect. Add plenty of color and a little texture with small circles of tissues paper to give your pumpkin a scalloped design. Natural or nature-inspired garland adds the perfect fall touch to a perfectly natural pumpkin. Make your own fun DIY disco ball pumpkin by gluing silver rectangular gems along the side of your pumpkin. It's sure to be a hit at your Halloween party. Give the feeling of magic with making your own enchanting glittery pumpkin. Personalize your Halloween pumpkin by adding your initial in gold glitter. Make this awesome gold-studded pumpkin by painting a pumpkin white and adding studs to create a patterned design. Practice the fun craft of string art by wrapping embroidery thread around nails tapped into a pumpkin. Create an unexpected stylized pumpkin for your home by adding a wood grain pattern onto it with this clever DIY.